In case you missed my presentation at Enterprise Connect 2011's Innovation Showcase last week, here's your second chance to catch it. 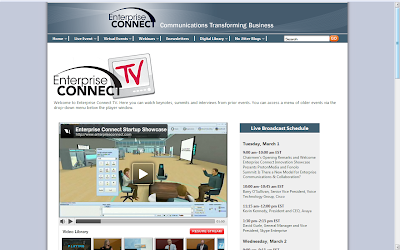 Videos of presentations at the show are posted on the Enterprise Connect TV website. After you log in, click the first video, "Enterprise Connect Startup Showcase." My presentation begins about a minute in. You'll be able to see a general walk-through of the major capabilities of ProtoSphere Lync Edition, and how organizations can use the platform with Microsoft Lync for meeting, collaborating, and communicating.